One of the difficult things about travelling is that it can get lonely. Whilst out on the road there have been long stretches when we’ve barely met a soul. We have woefully little French, Spanish or Italian and meeting people who have enough English to converse with us useless linguists is a rare thing indeed. We’re a pretty sociable bunch and it’s been a strain at times for us all not to have other folk to hang out with, which makes us all the more grateful when we do meet people who can tolerate our company for longer than a cursory five minutes. And we have met some fantastic people along the way. Most of the people we’ve spent time with and got to know a little have been those that have chosen to live a slightly different sort of life, a life in which there is more time for relationships, more time for reflection or simply more time for following dreams. As a tribute to some of those lovely souls and their inspiring stories I am enshrining them in blog for all eternity. 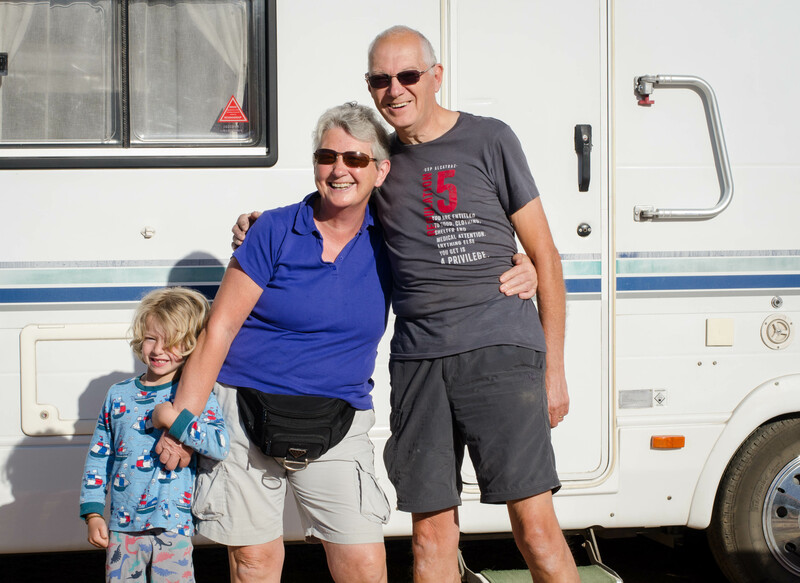 We met Ann and Martin in Morocco at a time when we were feeling disjointed and hadn’t quite settled into our travelling life. The children hadn’t been able to talk to anyone in their own language for a very long time and we were all craving a bit of company. Along come Ann and Martin, parking up beside our van in Tafroute bringing smiles and some much needed cuddles to our youngest traveller. Monty and Ann effectively adopted each other and for a few days we enjoyed their positivity and obvious zest for life. Ann had met Martin at a time when their children were grown up and life had dealt them both some blows. Eight years ago they bought a motorhome, rented out their house and set off for a life of travel and togetherness. They spend three months each year in Morocco, head back home for summer to see family and do a spot of house-sitting or odd-jobbing and the rest of the time travel where they please. They are warm, generous and full of life and we all felt grateful to have met them. On our last night together, they constructed a big fire of palm fronds and shared their valuable stash of wine with us. True friends. 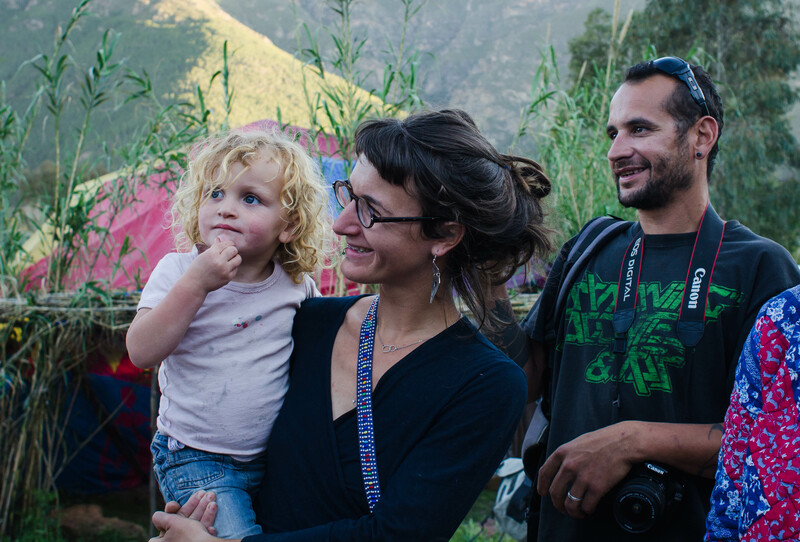 Severine and Patrice are the owners of the campsite Esprit Nature in Essaouira, and I’ve included them here because of their kindness to us when we were feeling fragile and because they’re another example of people who’ve made a big change in the way they live their lives. 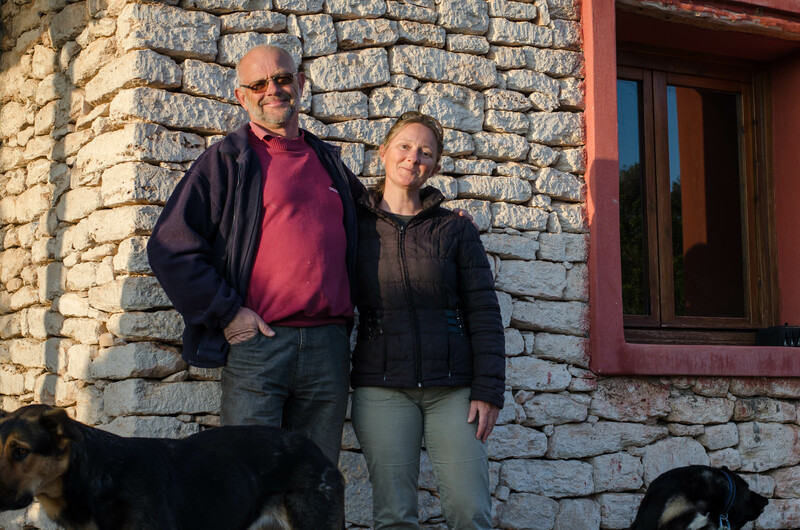 They were diving instructors in the north of France and one day decided they wanted a more relaxed day to day existence and to spend more time together as a family, preferably in sunnier climes. They sold up and bought some land in the Argan forest near Essaouira where they’ve created one of the most beautiful campsites we’ve stayed at. They have done most of the work themselves, from building the house to creating an adventure playground for any delighted children that happen to stop here. Severine makes delicious food that they invite you to eat in their living room. They were just the warmth and quiet positivity that we needed to get us back on the road refreshed and re-inspired. Ah Dave and Annie…how good it was to feel like we’d made some real friends and how the boys loved them and their three beautiful pups. 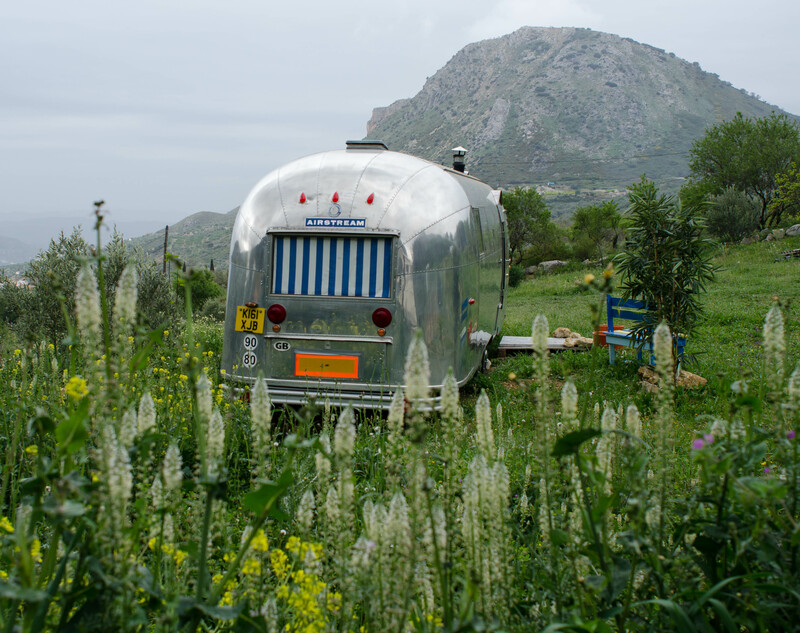 Dave and Annie were staying at Esprit Nature for three months in their celebrity Airstream, Vera. Seasoned travellers, they shared their enthusiasm for Morocco and gave us a list of places worth visiting, complete with campsites. Meeting fellow travellers who’ve been there before you is always a relief as they take some of the guesswork out of the whole affair. Their gorgeous camp and their hospitality – not to mention the dogs, Geordie, Lolly and Tinks – were so appealing that Monty would often disappear only to be found cuddled up in their awning with one of said pooches. So much did we like these chaps that we visited them at their home by Lake Vinuela in Southern Spain where they bought a cottage and a chunk of land a couple of years ago. Both Dave and Annie were very successful, busy type people who worked from dawn ’til dusk and lived. 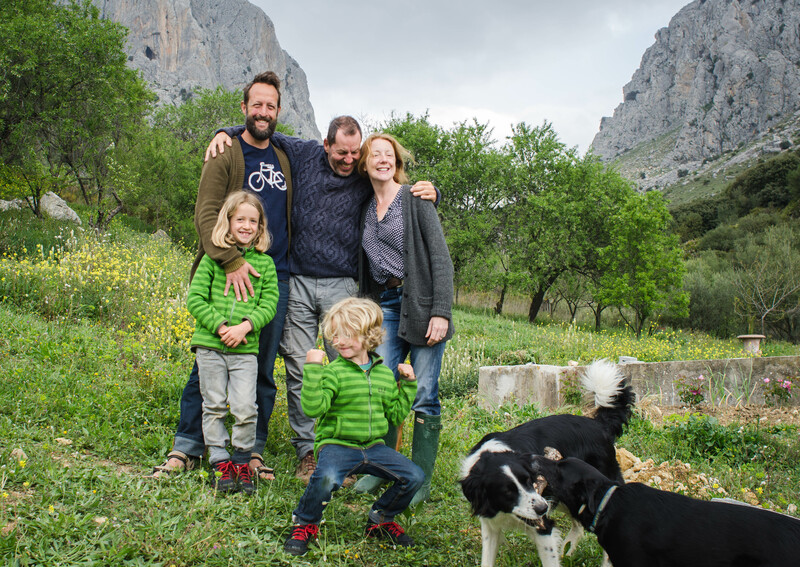 from the sounds of it, a very cosmopolitan life; until one day they decided it was all a bit mad and they’d prefer to work less and spend more time travelling, hanging out with the dogs, and pootling about their new Spanish homestead. So, they sold up and changed their life (is there a theme developing here??). When we visited in April the weather in their valley (which is usually scorching) was comfortingly British, so they lit the log burner and we all sat round watching movies, cuddling dogs and drinking gin. Annie even sorted an egg hunt for the boys as it had just been Easter. These people rock. 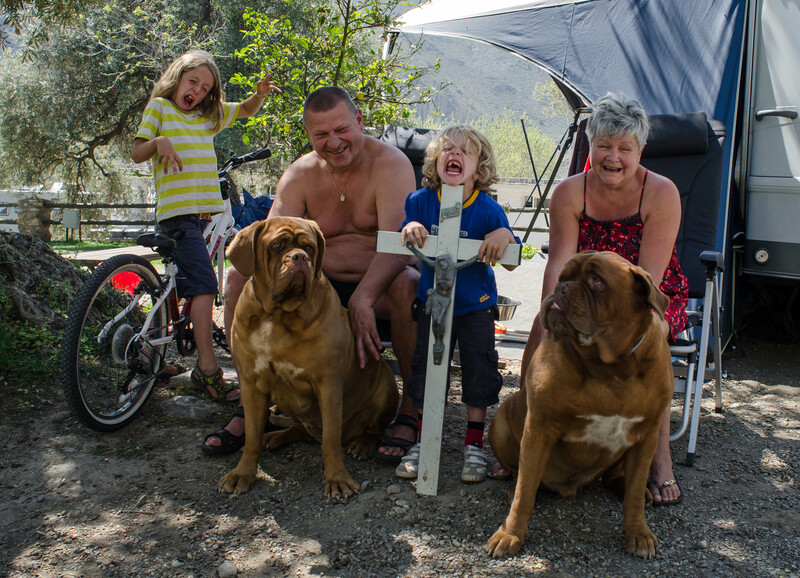 This family was the first real live family we got to hand out with while travelling. Hailing from Brittany in France originally, they’d sold up (what again?) and left their jobs to try and find a way to spend more time with their daughter and live less separate lives. We met them at Orgiva campsite, stayed with them at The Chunk and recently visited them in South of France where they have acquired an even bigger truck to live in and are trying to set up a festival catering company. Marion is the only member of the family who can speak English and she does a fantastic job of helping us all to understand each other; Yannick is an all round practical chap and thoroughly good egg who fixed our van for us and saved our bacon; Marcia is a super funky little tyke who adores Eli and Monty. The boys and Marcia seem to have no problem getting along and playing without having any means of verbal communication other than the very basics. The rest of us muddle along with bits of French and bits of English with lots of affection for each other being enough to keep the conversation flowing. I know. This is one of the craziest pictures I have ever seen and they’re my children – imagine how that feels. For some reason though Joke and Teo seemed very much charmed by our boys and the constant attention they gave to their fabulous award-winning dogs. So much so that they took time out of their relaxing holiday to talk to and entertain them fairly regularly. For Rob and I this seemed like the greatest kindness on earth, as the rest of the time they are demanding our attention and time! They took the boys along on their walks with the dogs and Joke even gave them gifts for Eli’s birthday. Generous, fun, good-humoured people that make the world feel like it’s a brighter place with them in it. Apart from the people in the pics, there’s been all the folk at Fertile Roots, countless helpful motorhomers, lots of kind random strangers, travelling Lynda and all the lovely people at Finca Slow (but more on them later!) So many people have brought smiles to our faces when we’ve needed it most, inspired us with their stories when we’ve wondered about our own, offered kindness or humour or friendship when we’ve been craving the company of old friends and familiar places and a couple have even stood in as temporary grandparents for the boys; laughing with them, giving cuddles and taking the time to really listen to all their wild witterings. It’s good to be reminded that the world truly is full of shiny people. Sel, I love this piece but it makes me miss you all.